The equity reflation party: on ice or just on hold? 2016 closed with the expectation that policy was taking a more reflationary turn, with Donald Trump proposing tax reform, and increased spending on infrastructure in the US, and Theresa May signalling at least a slowdown in the pace of deficit reduction in the UK. For equities, where top-line revenue growth is supported by nominal GDP growth, a modest pick-up in inflation after many years of persistently low inflation could have proven a helpful development. Using the five-year US dollar inflation swap as a proxy for future inflation expectations, the market moved from expecting inflation of 1.9% in July 2016 to 2.6% in January this year—a very significant move that was echoed in many other countries. These rising inflation expectations were reflected in bond markets through the latter half of 2016. In the US, 10-year Treasury yields rose from 1.6% at the end of September to a peak of 2.6% in early March. In the UK, 10-year gilts similarly saw yields rise from 0.75% to 1.5% between September 2016 and January 2017 (Bloomberg survey of economists’ views - June 2017). This period also saw economic news generally surprise to the upside, with the Citigroup Economic Surprise Indicator for the major economies consistently registering positive numbers through the fourth quarter of 2016 into the first quarter of 2017. Since the end of March, many of these trends have reversed. Inflation expectations have fallen again, although they remain above last year’s levels. Yields have fallen modestly, but again remain above the levels seen through most of 2016. And economic news has stopped surprising to the upside and, in some cases, has disappointed. These moves have caused some angst in equity markets as investors have questioned longer-term growth assumptions, with some even asking if we may be heading towards a significant slowdown or even a recession. Within the UK market, cyclical- and value-orientated stocks and sectors have generally underperformed. So, is the reflation story dead? Are we really heading for recession? Or does the truth lie somewhere between these two opposing viewpoints? The US economy—the world’s largest—is expected to grow 2.2% this year, according to the Bloomberg survey of economists’ views (June 2017). This forecast has mildly oscillated between 2.1% and 2.3% over the last 12 months, but has seen no dramatic swings. Inflation is forecast to run at 2.3% in the US this year—modestly higher than forecast a year ago. There is no sign that inflation is running away, nor that the world’s largest economy risks slipping into deflation. Global PMIs continue to point to further expansion. The chart below is from our Guide to the Markets series. 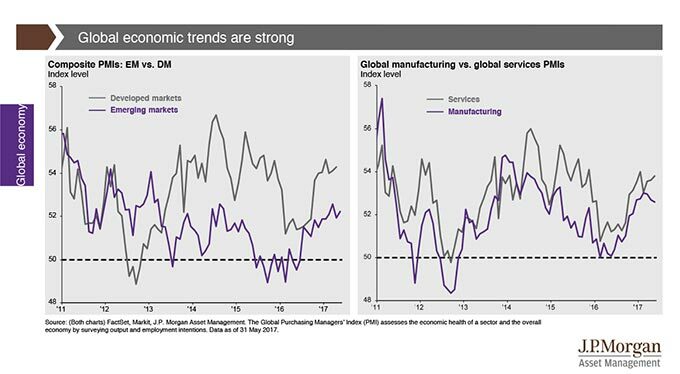 In both developed and emerging markets, the composite PMI is well above the level of 50 that points to expansion, with both services and manufacturing contributing. For the UK economy, the picture is obviously clouded by the recent election and the ongoing Brexit negotiations. However, the economy is still forecast to grow by a reasonable 1.6% this year and 1.3% next. Inflation has been driven up by sterling devaluation rather than any proactive policy actions. The failure of wage growth to keep up with inflation has caused some concerns, but as we pass the anniversary of the referendum and start to annualise the effects of imported inflation, we believe inflation could peak later this year before starting to gradually fall back through 2018. UK PMIs may have come in below economists’ forecasts, but they are still pointing to growth, with the latest reading for the composite at 54.4. Perhaps the million dollar question is where are we going from here? We can put forward a number of possible reasons for the market’s flip-flop from reflation euphoria at the end of last year to the relatively downbeat sentiment at present. Perhaps it reflects the over-optimism over President Trump’s ability to enact policy, or concerns over the sustainability of Chinese growth. Or maybe this is just the “normal” state of play for markets that are either bullish or bearish, but rarely anything in between. The recent move down in cyclicals, as the reflation trade has slowed, has left many of these stocks looking cheap despite global growth remaining supportive, for now at least. When we look at the current data, we continue to see a growing global economy, supported by purchasing managers’ indices (PMIs) in expansionary territory. 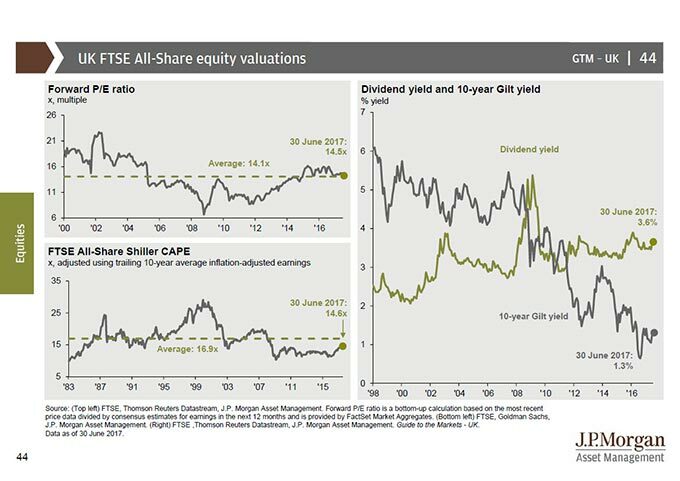 The UK equity market trades at a 14% discount to its long-term average on a cyclically adjusted price/earnings ratio basis, and in the meantime investors are paid a near 4% yield that looks to grow in the future. With 70% of the UK market’s revenues coming from overseas (Source: FactSet, Thomson Reuters Datastream as at 30 June 2017) and cushioning investors from short-term volatility in the domestic economy, UK equities continue to look an attractive proposition for patient investors. The ability to be selective and agile in the current environment will be key. For Professional Clients only – not for retail use or distribution. Please be aware that this material is for information purposes only. Any forecasts, figures, opinions, statements of financial market trends or investment techniques and strategies expressed are, unless otherwise stated, the authors own at the date of this document. They are considered to be reliable at the time of writing, may not necessarily be all-inclusive and are not guaranteed as to accuracy. They may be subject to change without reference or notification to you. JPMorgan Asset Management Marketing Limited accepts no legal responsibility or liability for any matter or opinion expressed in this material. The value of investments and the income from them can fall as well as rise and investors may not get back the full amount invested. Past performance is not a guide to the future. Issued by JPMorgan Asset Management Marketing Limited which is authorised and regulated in the UK by the Financial Conduct Authority Registered in England No: 288553. Registered address: 25 Bank St, Canary Wharf, London E14 5JP. 2ec835b0-616a-11e7-8224-005056960c63.